Design your best skincare regimen based on your skin’s needs. Let YOUTH Luminous Gel Oil Cleanser and Perfecting Skin Toner be the backbone to your daily skincare routine, then custom fit your serum, moisturizer, and night cream for healthy and beautiful skin. The Personalized Regimen is designed for you to customize your skincare regimen based on your concerns and preferences and to adjust it when you experience changes. YOUTH skincare provides the most advanced anti-aging and hydration benefits with options for selecting the serum, day moisturizer and night cream that best suits your needs. Consult the skin type chart in the tab to determine the products that are best suited for your skin type. Determine what your key concern is, such as getting more hydration, preventing the early signs of aging, protecting your skin from the weather, or caring for sensitive skin. Consider what your favorite type of texture is for personal comfort and how your regimen should fit in your lifestyle. Rejuvenate skin, help improve skin radiance and texture and reduce the appearance of fine lines: select the Youth Activating Serum, formulated with 10X concentration of our patent pending Youth Complex and gentle encapsulated Vitamin A retinol and Apple Cell to support skin renewal at the cellular level and address all major signs of aging. Replenish moisture instantly and revitalize dehydrated and dry skin: select the Moisture Activating Serum, formulated with 10x the concentration of hyaluronic acid blend to deliver intense instant hydration and plump skin. This fast-absorbing gel helps attract, retain and seal in moisture to form a protective barrier to reduce water loss while reducing the appearance of fine lines. Combine environmental protection and moisturizing benefits: select the Age Defense Mineral Moisturizer, formulated with naturally derived zinc oxide to provide chemical-free SPF 30 Broad Spectrum UVA/UVB protection. Vitamins and botanicals moisturize your skin and improve skin tone. Quench and soothe dry skin, plump and soften skin: select the Moisture Lock Day Cream, a cloud-like cream that seals in the active of your serum to maximize its benefits and protects skin from moisture loss for lasting hydration and a smoother, more radiant complexion. Rich, a luxurious cream texture with shea butter and jojoba that nourishes and soften skins. Light, a gel-like formula with marine algea for those who prefer a lighter texture. Each YOUTH product shown contains a 60-day supply. See individual products or the Directions tab for more information. Youth skincare is revolutionary. Formulated with powerful botanicals and advanced technology, it delivers remarkable anti-aging benefits thru cell renewal and intense hydration. 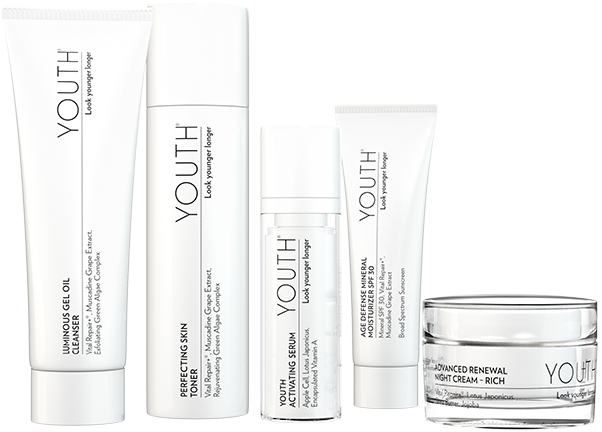 Reveal younger looking skin in just 7 days with the Youth Advanced Anti-Aging collection, powered by the patent pending Youth Complex. As we age, cell renewal slows and we produce less collagen and elastin. We created the patent-pending Youth Complex to support critical cellular functions that will restore your youthful glow. It combines powerful botanicals and vitamins to deliver remarkable results and is present in every single Youth product. Gentle encapsulated Vitamin A retinol to promote cell renewal, help improve skin texture and reduce the appearance of fine lines. Transform your skin with the Youth Advanced Hydration Collection, powered by our Active Cellular Hydration Technology™. The Collection features two superstars that work together to help bring back your skin’s glow and help it feel smoother, softer, more plump and hydrated: YOUTH Moisture Activating Serum which increases skin hydration 212% and YOUTH Moisture Lock Day Cream. Luminous Gel Oil Cleanser - Dispense a pea-size drop of cleaner onto hands and work into a very light lather. Rinse thoroughly. Youth Activating Serum - Dispense 1 to 1½ pumps onto fingertips and smooth gently over entire face. Apply twice daily. If you’re new to Retinol or have sensitive skin, start slowly with the YOUTH Activating Serum, starting with 1x/night, every other night or every 2nd night. If you notice flaking, peeling or redness, skip another night and use every 3rd night until skin adjusts. As your skin adjusts you can increase use to every night and build up to using every night and morning. Moisture Activating Serum - Apply morning and evening to a clean face, after toning step. Dispense 1 to 1 ½ pumps onto fingertips and smooth gently into skin. Application frequency can be adjusted depending on skin’s hydration needs. Age Defense Mineral Moisturizer - Apply a dime to nickel size drop of moisturizer onto fingertips, dot face all over and smooth in. You may notice a slight whiteish tint, which will dissipate once moisturizer is fully absorbed. Moisture Lock Day Cream – Apply in the morning after serum. Formulated to layer under makeup. Advanced Renewal Night Cream - Apply a dime-sized amount to face and neck each evening after serum is full absorbed. Design your best skincare regimen based on your skin’s needs. Let YOUTH Luminous Gel Oil Cleanser and Perfecting Skin Toner be the backbone to your daily skincare routine, then custom fit your serum, moisturizer, and night cream for beautiful skin.